A patient with GE Healthcare Pristina Dueta compression remote. “Patient-centered care” is a popular term among those in the healthcare industry in the 21st century. It means the patient is part of their own healthcare team helping to make decisions, and they are made as comfortable as possible throughout the process. Vendors are starting to adopt this approach for mammography, arguably the most critical tool for detecting breast cancer. Patient-centered mammography focuses on managing compression, streamlining or shortening the exam, and making sure the patient is fully informed about the procedure including breast density. New technological advancements are helping in all three areas. “Lack of consistent guidelines for mammographic compression can lead to a wide variation in execution. The study shows that adequate compression pressure is crucial for obtaining high-quality exams. Both very high and very low mean compression pressure can adversely affect mammography quality. Therefore, it is reasonable to suggest that standardizing to an intermediate compression pressure may lead to better screening outcomes and a better patient experience,” said Nico Karssemeijer, Ph.D., of Radboud University Medical Centre in Nijmegen, Netherlands. Mammography vendors have started to introduce enhancements to their systems that try to make the exam less painful for patients. One common enhancement is rounding out the hard corners of the system to better mimic the shape of the breast to allow for less pinching. Hologic introduced the SmartCurve breast stabilization system on the 3Dimensions system. This curved stabilization plate allows better distribution of force across the entire breast. Research shows the plate improved patient comfort in 93 percent of women who reported moderate to severe discomfort during compression. An image processing algorithm inside the SmartCurve ensures there are no changes in positioning or workflow for the technologists and radiologists administering the exam. GE Healthcare literally put compression in the patient’s hands with their newest mammography system, Senographe Pristina, which launched in the U.S. in early 2017. After the initial launch, GE gained U.S. Food and Drug Administration (FDA) approval for a remote device called Dueta that allows patients to control their own compression. The technologist does the initial positioning and compression and then hands the remote to the patient for final adjustments. GE sponsored a study of 315 patients across two sites in Europe to assess patient satisfaction with Senographe Pristina. Overall, 83 percent of patients scanned on the system rated their experience as better than with traditional mammography systems. Seventy percent noted the exam was more comfortable, and 66 percent perceived the exam was shorter.2 A separate study at the Gustav Roussy Cancer Center in Villejuf, France, revealed something even more surprising: Overall, women who used the self-compression device tended to apply more force than the technologist. “It’s like the difference between you pinching yourself and someone else pinching you,” said Agnes Berzsenyi, president and CEO of GE Healthcare Women’s Health. Siemens offers Personalized Soft Compression on the Mammomat Revelation, which adjusts the level of breast compression automatically to suit each patient’s anatomy. This combines with the SoftComp paddles for quick and easy compression. Physical comfort is just one important element of a patient-centric mammography exam. When it comes to their own healthcare, patients today want to be armed with as much information as possible to make decisions. Over the last decade, women in particular have become more aware of the need to ask their healthcare providers about fibroglandular breast density and how it impacts screening and breast cancer risk. As of publication, 36 U.S. states have passed legislation that either encourages or requires mammography providers to make patients aware of their own breast density and its possible effects on mammography. As the density inform movement continues to gain momentum, new technologies are emerging to properly assess and report on fibroglandular breast density. then calibrates the patient’s breast density to the appropriate category corresponding to the American College of Radiology’s Breast Imaging-Reporting and Data System (BI-RADS). The software is compatible with iCAD’s DBT platform on both GE Healthcare and Hologic mammography systems. “Since implementing PowerLook Density Assessment, our radiologists have been able to provide more consistent breast density results for our patients during screenings. We must consider many aspects of each patient’s case at once, but PowerLook Density Assessment allows us to focus on our primary goal of finding breast cancer. Density matters and we believe the greater accuracy of assessment with iCAD’s PowerLook Density Assessment will result in greater patient satisfaction and improve patient care,” stated Beth Ingram, M.D., radiology, interventional at Reid Health, Indiana. While making the exam more comfortable goes a long way toward a patient-centric approach, any opportunity to streamline or shorten the exam should also be top of mind. If suspicious findings are detected on a mammogram, the next step is to take a biopsy of the tissue in question and analyze whether it is cancerous. Traditionally, this has meant taking the sample — a painful process for the patient — and taking it to another room to be analyzed. 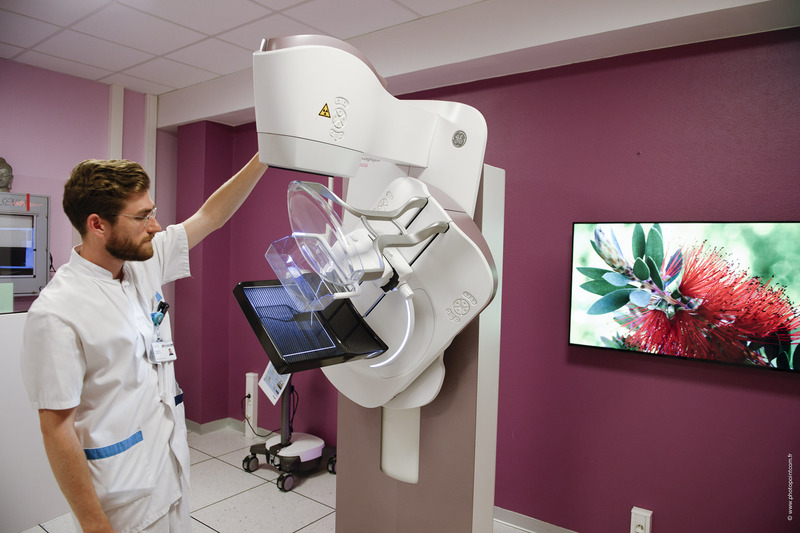 Siemens Healthineers looked to streamline this process with the Mammomat Revelation mammography system, which features onboard biopsy and specimen analysis tools. The HD Breast Biopsy solution offers one-click targeting of suspicious areas in a mammogram, and the integrated InSpect specimen scanner completes the tissue analysis in just 20 seconds. The technologist does not have to leave the room at all during the process, leaving the patient alone to wonder and worry what the results will be. • DBT biopsies are shorter procedures than stereotactic biopsies, which can be 30-60 minutes. The ultimate goal behind all of these technological advancements — whether in compression, density assessment or streamlined biopsy procedures — is to make the mammography experience more amenable to the patient. As long as healthcare continues to move toward a more patient-centered, value-based enterprise, women’s health facilities may look to employ a combination of these and other technologies to make patients lives easier. The Gustav Roussy Cancer Centre, in collaboration with GE Healthcare, has been working to provide such an experience to women at its One Stop Clinic. “One of the most stressful experiences a woman can face is hearing that her mammogram had suspicious findings,” said Berzsenyi, noting that patients may sometimes have to wait four to seven weeks to receive a final diagnosis. In hopes of providing same-day diagnosis and treatment, GE worked with Gustav Roussy to open the first One Stop Clinic in 2004. Envisioned as an international program, visitors to the One Stop Clinic have access to a comprehensive suite of mammography systems, as well as biopsy services, automated breast ultrasound (ABUS) and contrast-enhanced spectral mammography with GE’s SenoBright HD system. “Providers will have to think about how to engage more women in breast cancer screening,” said Berzsenyi of how this model could impact women’s healthcare in the future. 2. IPSOS Patient Satisfaction Study sponsored by GE Healthcare, conducted with 315 patients across two sites in Europe, February 2017. Data on file.